I’m excited to bring you a special guest this week – my wife, Katherine Entzminger. Ordinarily, she wouldn’t be interested in something like this but she’s really felt God moving her to share some of the stories from her time as a missionary. 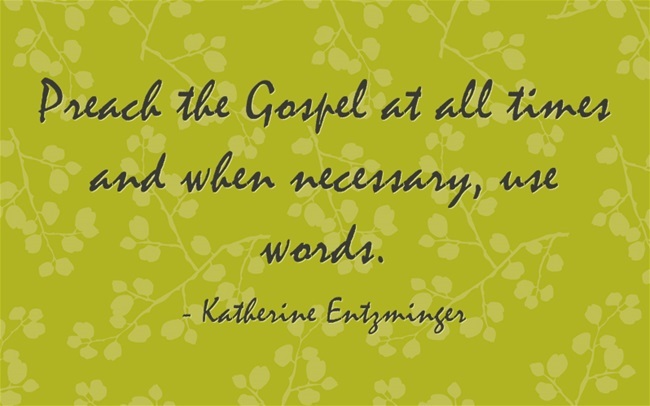 Preach the Gospel at all times and when necessary, use words. Right now Katherine is a full-time homemaker but she spent about 4 ½ years as a missionary with Youth with a Mission (YWAM). While in YWAM, she traveled to Mexico and Central America, Africa, India, and Central Europe. She also spent time as part of the support staff on a YWAM base. After her time with YWAM, she went back to school and re-entered the marketplace. And that was all before she and I ever met. What Katherine would focus on for the first seven days in a new country and what she would do to ensure she wouldn’t be distracted from it.